On the last day of August, as we start to say goodbye to summer and welcome autumn’s charm, our thoughts and stomachs long for roast dinners and hearty puddings. I took the opportunity to go foraging for blackberries this weekend as the weather has been lovely and mild. Even though a lot of blackberry bushes are past their prime at this time of year, my boyfriend and I went out to Walthamstow Marshes with our eagle eyes and were in luck as we picked a generous punnet’s worth. 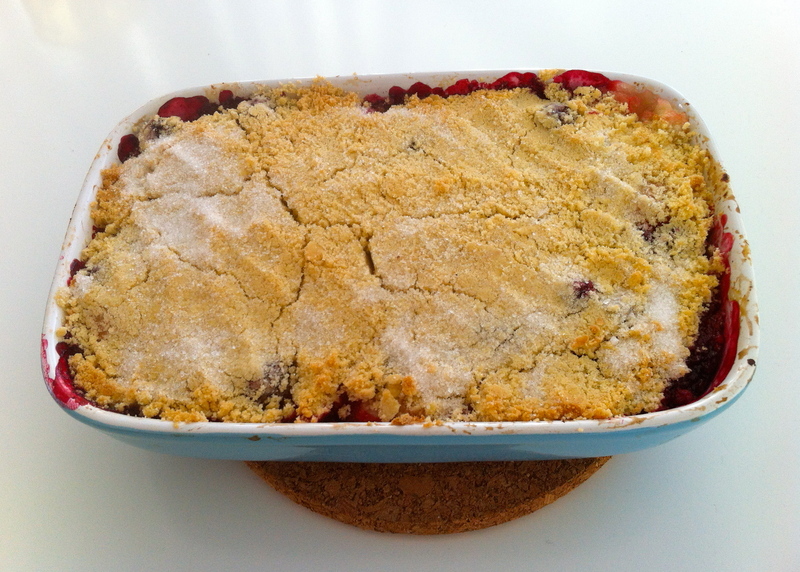 To make the most of our efforts, we had a simple and scrumptious apple and blackberry crumble to follow a Sunday roast. The only ingredient I needed to buy that we didn’t already have at home was cooking apples which I got from my favourite grocers, the International Supermarket, on Walthamstow High Street. My mum’s crumble recipe, which, as a child she allowed me to have without the fruit as I thought it was too sour (I think she empathised with my sweet tooth) worked a treat. 1. Turn the oven on to gas mark 5. Half-fill a medium saucepan with water and bring it to the boil. 2. Meanwhile, wash and peel the apples, and cut them into cubes (somewhere between 5 and 10cm). When the water starts to bubble, plop your chopped apples into the pan and cook on a medium to high heat for seven minutes. Use a knife to prod one of the apple cubes, and if their texture is soft, turn off the heat, drain them in a colander and set them aside. 3. Here comes the fun part! Tip the flour and butter into a medium sized bowl. Using your fingertips, blend the butter into the flour until it reaches the consistency of breadcrumbs. 4. Spread the apples out into a small to medium sized baking dish. Pour the blackberries on top and mix them in with the apples so they’re evenly distributed. Sprinkle the sugar over the fruit, making sure it gets in all the nooks and crannies. Scatter the crumble mixture to cover the fruit. Lastly, sprinkle the second helping of sugar on top. 5. Put the crumble in the oven for 20 minutes, or until it starts to look golden brown on top. When it’s ready, get it out of the oven and leave to cool for 10 minutes. 6. Serve with warm custard or some cream. Et voila. While I’ve been at home getting over a lingering cold, I’ve finally got round to writing my first proper post (rather a long time coming, I know). While browsing some food blogs earlier, I came across this set of summer vegetarian recipes on the Guardian and decided to have a go at adapting the ‘really hungry burger’ with ingredients I already had at home. When eating out, I often find veggie burgers disappointing; the “mushroom burger” which is essentially a portobello mushroom with a bit of cheese on top shoved between a bun (come on, that does not qualify as a burger) and the mushy spicy bean burger are recurring let-downs. So when I saw the ‘really hungry burger’ above, I was pleasantly surprised, as it looks like one monster of a pattie. 1. Heat the olive oil in a frying pan on a medium heat. Add the mushrooms and scatter the dried thyme over the top, frying for 5-10 minutes, or until the mushrooms have softened. Take the pan off the heat and pop the mushrooms in a bowl to cool. 2. Add the cannellini beans, garlic, parsley, tamarind and soy sauce to a food processor, or if like me, you do not have space for such a big gadget, pop it in a tall-sided bowl, pull out your “jhoojher”, i.e. handheld food blaster, and pulse until you have a thick, fairly smooth mixture. 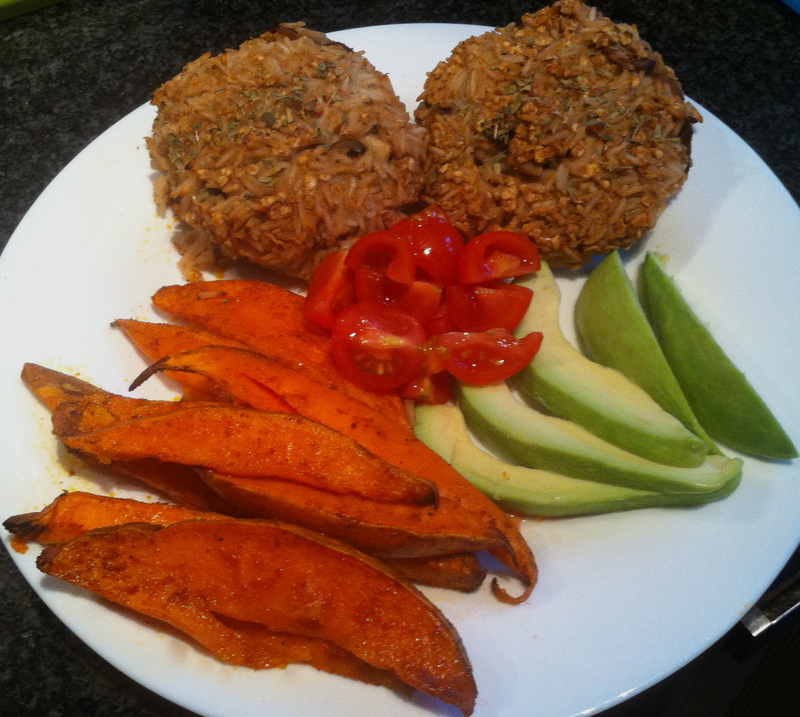 Add the rice/quinoa, oats, lemon juice and cooled mushrooms and leave to chill in the fridge for 10 minutes. 3. Meanwhile, turn the oven on to 230C/gas mark 8. Add your healthy helping of olive oil to a baking dish and pop in the oven to heat up for five minutes. 4. Chop your sweet potatoes in half and then, depending on how big they are, cut the halves into thirds or quarters. 5. Take your baking dish out of the oven and add your sweet potatoes to it, making sure there is a thin coating of oil on each of the wedges. Then sprinkle some cayenne pepper over the wedges and season well. Put them in the oven for 25 minutes. 6. Once your spuds are in the oven, so to speak, line a baking tray with a sheet of greaseproof paper. Get your burger mixture out of the fridge and separate it into four burger shapes. Space each of the burgers out evenly on the baking tray and put in the oven for 15-20 minutes. 7. While your main events are cooking, slice an avocado and some cherry tomatoes to have as a garnish. 8. When your burgers are looking golden brown on top, they’re ready. Get them out of the oven and carefully lift them on to your serving plates. 9. Give your sweet potato wedges a prod with a knife and if they feel soft then get them out too and serve alongside the burgers. 10. Serve with your favourite sauces: I opted for sweet chilli sauce, low-fat mayonnaise and houmous.